Art/iculation is a biannual print and digital magazine founded by McGill graduate student Sofia Misenheimer (MA Communication Studies) and co-edited with Vincent Mousseau (U2 Social Work). 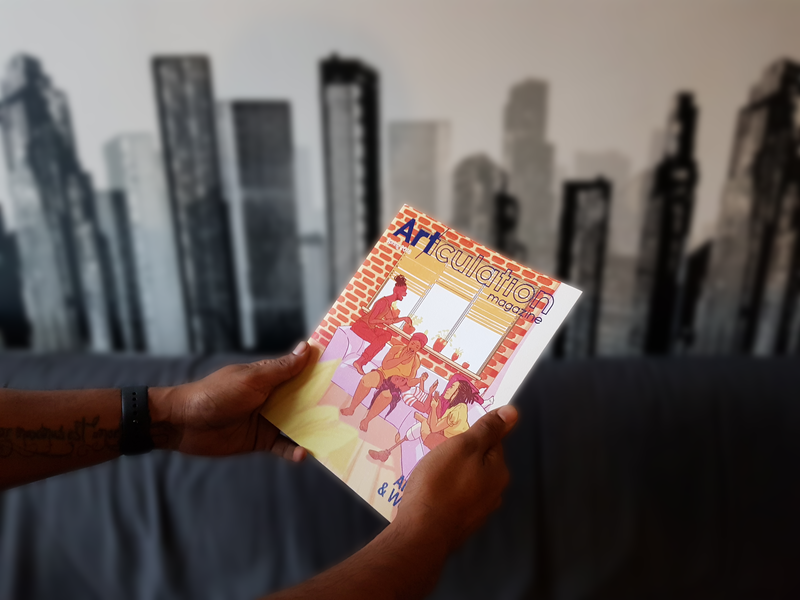 The publication challenges dominant perceptions of arts and culture and showcases the work of contributors from un(der)represented local communities—two of many standout features that distinguish Art/iculation from other student magazines. The local community-based outlet employs an inclusive and interdisciplinary approach to publishing in an effort to empower those most often excluded from mainstream media. With contributors and readers who span the globe, the magazine is gaining traction beyond its Montreal fan base. Art/iculation is currently a finalist for Best Academic Publication from the 2018 Canadian Online Publishing Awards, based in Toronto. It is the only nominee from the province of Quebec and sole contender not backed by a university journalism program. Arts Life Magazine spoke with Sofia and Vincent to learn what it takes to run such a unique publication. Zahra Habib: Tell me a bit about yourselves. Sofia Misenheimer: I received my B.A. in French Language and Literature,and Cultural Anthropology from the University of North Carolina, Greensboro in 2011. After graduation, I moved to Washington, DC, where I worked as a court reporter for several years and later became the coordinator for an international humanitarian NGO. Four years ago, I moved to Montreal to completea graduate degree in Journalism at Concordia, and nowI’m in the final year of my master’s degree in Communication Studies at McGill. In my spare time, I work as a freelance writer and graphic designer. Vincent Mousseau: I completed my first Bachelor’s in Political Science at the University of Ottawa. I loved the field, but unfortunately didn’t find it responded to my career needs. Now I’m doing a Bachelor’s in Social Work at McGill. I have long been involved in activist circles, like Black Lives Matter and anti-austerity in Ottawa. At McGill, I’ve been working in solidarity with transgender students, and doing human rights advocacy on campus. I met Sofia at the Trans March last year, and we’ve been working together ever since. What made you start this magazine? S: In 2016, I became president of the Art History & Communication Studies Graduate Student Association (AHCS GSA), representing Communication Studies’ students, and developed an innovative project with the GSA executive team that diverged from the usual emerging scholars conference, but still spoke to the strengths of both sides of our department. We ended up producing a two-week art exhibition and launching Art/iculation. The theme of the project was ‘While No One Was Looking’, a critical exploration of the Montreal 375th anniversary celebrations. The reception was so positive that we decided to continue the magazine and develop our niche beyond that project. How did you develop that niche? Were you responding to it, or did you create it? S: It was already there. As much as people say that print is dying—I heard that a lot during my time in the Concordia Journalism program—I think we just need to adapt how we approach and develop print media. The response to our submission calls is a testament to how much people want this kind of publication—one that is accessible and inclusive, and that focuses each issue on a timely social question. So the first issue was a graduate student initiative? S: It was initially intended as an outlet for students in the Faculty of Arts to share their work and gain publishing experience, but we were mindful to invite submissions from all local secondary institutions, including UdeM, UQAM, and Concordia, as well as from those outside the university context. Opening submissions to a variety of sources has enabled us to publish bilingual content that’s more widely representative of local perspectives since the inception of the magazine. How did you reach out for those external stories? And what was your purpose? S: Montreal campuses often exist in separate bubbles, so we have used the magazine to create inter-university dialogue and networking. We share each submission call with nearly a hundred different student organizations across the city, and sometimes they reach folks outside of Montreal. Our last issue actually featured work by talented artist Shanmukha Inkas, who is based in India, and Brazilian poet Daniela Picchiai. How have you maintained connections with McGill? S: Art/iculation is supported predominantly by on-campus grants, departments, and organizations that offer small amounts of funding and even space to work. The Institute for Gender, Sexuality, and Feminist Studies (IGSF) and IGSF Director Alanna Thain, in particular, have been tremendous advocates for the magazine. We’re grateful to the McGill Alumni Association (MAA) for their ongoing support. Vincent and I presented the latest issue of the magazine at the MAA Annual General Meeting just last month. I think having a visually striking and tangible document gets people interested. We’re lucky to have a variety of sponsors, but they change every issue because most donations are small. Fundraising is imperative because we compensate contributors. V: Our goal is to lift as we climb, as Angela Davis puts it. As a magazine, we want all of our contributors to come up with us. How can you ensure you’re uplifting voices when you can’t pay people for their work? S: Each member of our editorial team is proactive on campus too, so Art/iculation is affiliated with various McGill projects. For instance, the Growth on the Horizon project I co-founded earlier this year with Cassie Jones, a recent McGill graduate, inspired the theme for Art/iculation’s upcoming issue: “The Art of Healing”. The magazine sponsored a “post-secret” workshop as one of over 40 arts-based activities that called attention to gender-based violence on Montreal campuses. S: The magazine format is adaptable. We publish both digital and print versions to reach as wide a readership as possible. Print magazines are distributed via local bookstores like L’Euguélionne, Racines, and Drawn & Quarterly, which makes our material accessible those who may not have access to internet. V: If you’re going to challenge what culture is by challenging the mainstream, then distribution needs to be creative. The website has been absolutely phenomenal for fulfilling our mission, allowing us to highlight voices who do not normally get attention in mainstream media. S: Or if they do, they’re tokenized. And the goal of this magazine is to counter those norms. It’s nice to see the amount of care the magazine puts into how it represents different voices. V: Ultimately there’s so much diversity in the cultural scenes of Montreal, and Quebec more generally. To limit stories and representation does a disservice to the artists who are working around the city, and it’s important especially at a time where we are seeing so much division. S: We blind review submissions as a team, going through each piece and seeing how they interact with each other and engage more broadly with the chosen theme. Then we contact contributors, letting them know what the process will look like. We stay in dialogue with contributors throughout the process; they have to accept any edits to their work before it is published, and even when we design a page layout, we want to ensure that it supports their vision. S: No, I do a lot of freelance graphic design work and I design for the magazine, but I don’t consider myself an artist per se. I’m peripherally involved in local arts communities through my research on urban art subcultures, but I prefer to channel my own creativity into writing. V: I’m definitely not an artist. I tie my output in the magazine with social work. You wouldn’t think of it, but what is more empowering for marginalized communities than to provide a platform? And what is the role of the social worker if not to empower their clients? We see our first-time contributors so happy and excited to see themselves in print, because it’s validating to be published. For me it’s a profoundly social project, a continuation of my social work practice, and my work to create a just and more equitable world. How did you build an editorial team? S: We started off small and have been growing incrementally as students approach us about getting involved. Our team spans students from Social Work, Psychology, and the Gender, Sexuality, Feminist, and Social Justice Studies (GSFS) program—we’re truly interdisciplinary. What is it like to be nominated for Best Academic Publication by the Canadian Online Publishing Awards? S: The whole team is excited! The nomination was a pleasant surprise, because our magazine challenges the mainstream and you never know how people will react. For the “Alive & Well” issue that celebrates gender diversity and highlights predominantly trans voices to be up for this award is a testament to the power of each contributor’s submission individually and the strength of their narratives in tandem. It has been humbling and a real honour to publish such impactful work. How would winning the award change the game for Art/iculation? S: We would be able to call ourselves an award-winning publication, which I hope would help us secure more long-term funding so we can to continue to compensate contributors and increase our print-run. V: It shows that the value in this work is gaining recognition, and it’s encouraging for artists to know they can break into the mainstream. We are trying to lead by example in that regard. What kind of unexpected hardships did you come across? S: There’s an expectation in academia that people work for free. Most grants stipulate that they can only go to towards event or printing costs, and a lot of times there’s no built-in consideration for honorarium. We’ve managed to work around that with fundraising. The other thing is trying to explain how our publication differs from others, which usually requires seeing it and having a discussion. Otherwise people might automatically fit it into their conception of what a publication usually looks like. What is the next issue about? S: The next issue explores how creative processes like illustration, writing, or poetry can jumpstart or assist the healing process after instances of trauma, or in cases of stress, anxiety, chronic pain, or mental illness. It also looks at healing as an art form in and of itself. How do you reconcile your community-geared identity with being an academic publication? S: There are so many different ways of having and conveying knowledge; you don’t have to write something in a traditional scholarly way for it to qualify as academic. The critical approach of our published submissions, no matter the format, maintains the academic quality of the magazine. V: In social work, we use multiple tools as main methods of research, like poetry and storytelling. Our work shows people that their experiences are valid and worthy of academic study and critique, just like any other subject studied here. Art/iculation is bridging the gaps between academia and the everyday experiences of people. That being said, I often struggle to define what we’re doing. What is this project? It’s clearly a magazine, but it’s so much more than that. I like to call it a publication, because its structure is so radically different from other magazines. Either way I’m happy to be changing that dynamic of what a magazine is. The next issue of Art/iculation will be released in November. For updates, you can follow the magazine on Facebook or subscribe for notifications via the website.